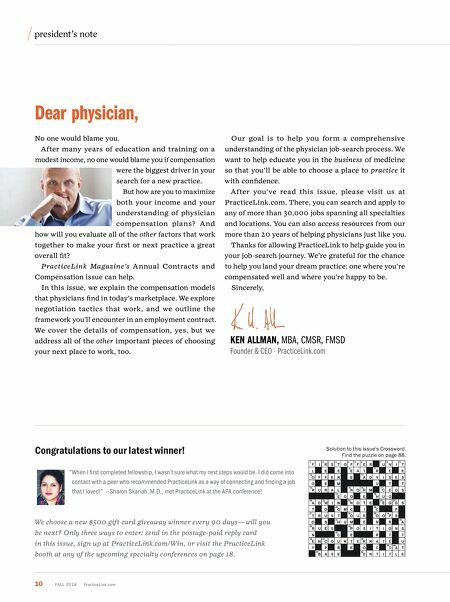 10 Fall 2018 Practice l ink.com president's note Dear physician, No one would blame you. After many years of education and training on a modest income, no one would blame you if compensation were the biggest driver in your search for a new practice. But how are you to maximize both your income and your understanding of physician compensation plans? A nd how will you evaluate all of the other factors that work together to make your first or next practice a great overall fit? PracticeLink Magazine's Annual Contracts and Compensation issue can help. In this issue, we explain the compensation models that physicians find in today's marketplace. We explore negotiation tactics that work, and we outline the framework you'll encounter in an employment contract. We cover the details of compensation, yes, but we address all of the other important pieces of choosing your next place to work, too. Our goal is to help you form a comprehensive understanding of the physician job-search process. We want to help educate you in the business of medicine so that you'll be able to choose a place to practice it with confidence. After you've read this issue, please visit us at PracticeLink.com. There, you can search and apply to any of more than 30,000 jobs spanning all specialties and locations. You can also access resources from our more than 20 years of helping physicians just like you. Thanks for allowing PracticeLink to help guide you in your job-search journey. We're grateful for the chance to help you land your dream practice: one where you're compensated well and where you're happy to be. Sincerely, Congratulations to our latest winner! KEN ALLMAN, MBA, CMSR, FMSD Founder & CEO · PracticeLink.com Solution to this issue's Crossword. 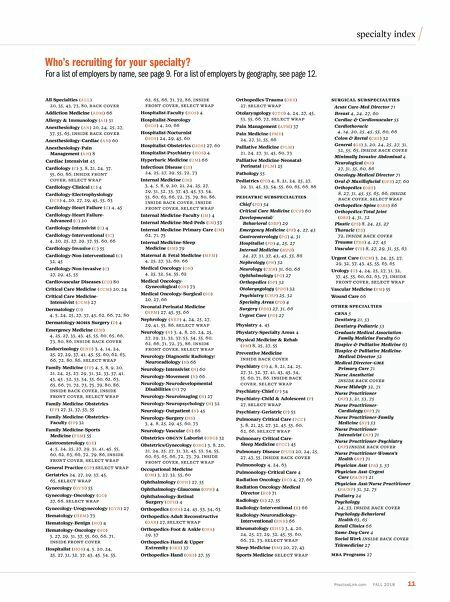 Find the puzzle on page 88. "When I first completed fellowship, I wasn't sure what my next steps would be. I did come into contact with a peer who recommended PracticeLink as a way of connecting and finding a job that I loved!" —Sharon Skariah, M.D., met PracticeLink at the APA conference! We choose a new $500 gift card giveaway winner every 90 days — will you be next? Only three ways to enter: send in the postage-paid reply card in this issue, sign up at PracticeLink.com/Win, or visit the PracticeLink booth at any of the upcoming specialty conferences on page 18.